Everyone daydreams about one day moving out of their parent’s house. The idea of your own space that you can manage yourself and have privacy is just like gold for a teenager. The thing is, there are a lot of things that you need to learn before you move out of your parents’ house; whether you’re a teenager or not. There’s no shame in sticking around at home until you have that house deposit saved or you find the right house for you to move into. Basic Cooking. There’s nothing satisfying about living on microwave meals or Ramen with cold cuts. Learning to cook a few simple, healthy dishes that don’t take too many ingredients is something that you should learn before you venture out on your own. No one else is going to look after your health, so you have to. Basic Budgeting. You’re in a job already and ideally you are paying for your phone bill and paying a little housekeeping at home. If you learn to budget your money, you can use services like debtconsolidation.co to keep your outgoings as low as possible while still paying creditors. The more money you free up, the more you have for fun things like travelling and shopping! Basic Healthcare. Taking a first aid course and learning how to patch up a wound and which medications you should always have in your medicine cabinet is important. You need to know what to do to help yourself if you have migraine or any other illness that doesn’t require a doctor. Basic Housekeeping. Living alone means learning how to clean up after yourself, iron and launder your own clothes and learn how to unclog a toilet. Moving out means gaining the ultimate independence, so you need to know how to do these things to be self-sufficient. Basic DIY. Replacing a lightbulb or a fuse and fixing a broken appliance are beyond a lot of people, but if you teach yourself these skills before you leave home, you can save yourself some cash on hiring out the professionals to do it for you. Moving away from your parent’s house – no matter how old you are – is a difficult prospect. Exciting, but difficult. There’s no way to know whether you are truly prepared until you actually move out. Spend time practicing at your parent’s house before you go so you can ask as many questions as you need before you go. Holidays are an adventure. They’re about discovering new things, and one of the best ways to learn about a country’s culture is through their food. You can learn a lot about a country from the food and drink they serve, and Kuala Lumpur is one of the hottest destinations in Asia to experience a diverse fusion of cuisines. Many of these places are local areas that are close to public transport, so make sure you book a room at budget hotel in Kuala Lumpur, Malaysia in advance so you can be as close as possible to these delicious eateries. Naughty Nuri’s is a popular BBQ restaurant and bar. It’s well known for its mouth-water BBQ pork ribs and cosy atmosphere. The staff are extremely well-mannered and provide a great service to the customers. It’s a popular spot for both lunch and dinner, so make sure you get here early. If you love Korean BBQ, you’ll love Naughty Nuri’s. This is a diverse food court with many different styles of cuisine to indulge in. There’s also a fantastic selection of exotic fruits such as durian and mango. This is a predominantly Chinese area, which means you’ll find a lot of iconic dishes like Wan Tan Mee, Bak Kut Teh, and Hokkien Mee. Nasi Kandar is a Malaysian dish that consists of steamed rice and a variety of curries and side dishes. It’s very reasonably priced, but that doesn’t affect the amazing quality of food that Tg’s offers. This is a popular hangout destination for workers and students, so expect it to be packed with patrons throughout the day. Din Tai Fung is a restaurant chain that originates from Taiwan, and they’re known for their mouth-watering soup dumplings or xiaolongbao as they’re called. This is an entertaining location because the only thing that separates you from the chefs is a glass window. You can watch the chefs skillfully put together your dumplings moments before they’re served to you. Heun Kee is a relatively hidden spot near the Pudu wet market. It is, without a doubt, one the most famous clay pot chicken rice spots in the whole of Kuala Lumpur. Their signature dish contains juicy chicken, delicious lap-cheong, and there’s optional salted fish as well. Huen Kee prepares their clay pot rice with a special method that speeds up the cooking process and evenly cooks the rice—something that other places just don’t get right. Nasi Lemak is a fragrant rice that’s cooked in coconut milk and pandan leaf and is considered the national dish of Malaysia. This location is affordable, and the sambal (Malaysian hot sauce) is also delicious here. One of the most popular dishes here is the “Ayam Goreng Rempah”, which is essentially a spicy crispy fried chicken that pairs well with the rice. I think having a bucket list is a great idea. Setting and achieving goals is how we can all progress in life. So if you don’t have one already, then you should! I have set one in general, but I think there are a few other things that I would like to add. As a couple, we love to travel, so I need to include some more places that we would like to visit. Being able to travel in style would be amazing too. I would love to fly first class to a long haul destination and stay in a luxury hotel. Having a chef to cook for us while we are there would be the icing on the cake; quite literally! That would be the plan to do some day, each time we travel. I just need to make my millions! So here a few ideas and dreams of mine. Have you ever been to any of them? Would love to hear about it if you have. I think a cruise is one of the ultimate ways to see the world in style. You can get to experience a variety of places, as you sail around several countries and islands. The Caribbean would be one of the top choices. As there are so many of the islands that I’d love to visit, a cruise would help you to see plenty of them. I like the idea of hopping off and on as seeing some lovely places in this world. There are so many luxe cruise liners out there too. So it makes the time on board fantastic, and they’d make sure you are treated like a guest. All inclusive activities and food would be a dream. Having been to Asia once before, it would be fantastic to visit again. It isn’t a continent that is necessarily synonymous with luxury, but there are plenty of places that fit the bill. Staying in a luxury hotel in Bali or on the island of Phuket would be a dream come true. The beaches in those places are second to none. White sands and clear seas make it perfect for relaxing, as well as diving and snorkeling. Not to mention the fantastic weather that is pretty much all year round. Even in the ‘rainy’ months, the temperatures are high. Asian food is to die for, so having it made for you each day would be amazing. Italy is such a gorgeous location. The Amalfi Coast, including places like Capri, can get a little bit forgotten about. When you think of Italy, most people think of Venice or Rome. But the Amalfi coast area is just stunning. There are plenty of exquisite restaurants to visit, to try the Italian cuisine in style. A lot of them are tucked away off the main areas, so feel like such a private getaway. It would be awesome to have a little road trip along the coast, and stop off at all of the towns along the way. The clocks have officially gone back! It’s no longer pitch-black at 6 pm. That’s right folks; spring is here. And what does that mean? Summer is just around the corner! Hurrah! There is a still a little time, though. So how to make the most of it? Here are three hobbies to consider taking up as summer approaches. Whether you’re slightly addicted to Masterchef and The Great British Bake Off or not, baking is a great hobby. Sure, buying all the ingredients can be quite costly at first. But actually, once you’ve built up a collection of the basics, you’ll save money on buying the products fresh. A bag of self-raising flour, for example, will be good for at least a handful of bakes. Baking is also a great hobby for people with strict dietary requirements. It can be a real challenge to find products that are wheat-free or dairy-free. Plus, they tend to be pretty rammed with sugars and sweeteners. By making your own, you are in control of what does and doesn’t go in them. You can also make recipes just the way you like. You can make amazing brownies without pecan nuts if you don’t like them. Or make a triple chocolate cake with whipped cream in the centre; the world is your oyster. You can really let your creative juice flow. Need some ideas? Facebook groups like Delish post different inspiring recipes every day, both for baking and cooking. The days are getting longer, and nature is looking beautiful again. Capture the magic by taking up photography. You can focus on any genre you like, be it people, wildlife, landscape or cityscapes. Or just snap whatever takes your fancy from day to day. Photography is one of those hobbies that can be as versatile as you like. If you like fast-paced environments, take shots of shoppers, or runners, or sunsets. Or, if you want to take it a bit steadier, go for landscape or nighttime shoots. Don’t just use your phone either. The pixels might be high, but the quality just won’t match up. Invest in a good quality camera, and a sturdy Camera Bag to keep your purchase safe. One of the people who have inspired me a lot in the past years is Jamie Oliver. I have started to follow his work mainly because to me, he is one of the top chefs; not just in Europe but worldwide. He offers tons of recipes online, and sells various books with his cuisines, targeted towards healthy food as well as not too “expensive” so that us, the plain Jane and regular Joe can afford to try it out. Along the years, Jamie has become more than just a chef. He owns his own Franchise Restaurants “Jamie’s Italian” which are magnificent by the way! As a non UK resident, I still had the same privilege; I subscribed to the gold club, and am taking advantage of several offers and features while dining in one of his restaurants. Furthermore, Jamie has been campaigning to instil a healthier Britain; to educate people to eat healthier, by inspiring them to cook at home rather than buying cheap eats on a regular basis; to help the nation fight obesity, by mastering a healthier lifestyle – food-wise and exercise-wise. Last November, Jamie Oliver introduced his own recommendations to tackle childhood obesity. He suggested a new tax on sugary drinks, fairer marketing as well as a school food plan among others. Today, 16th March 2016, in London, the parliament has decided that within the next two years the sugary drinks tax will be implemented. This is not just a win for Jamie, but Britain as a whole. It is one of the steps to fight obesity, not just in children but adults alike. I personally think, that such tax should be present in all the world. MALTA are you listening? If fast food and soft drinks weren’t so cheap, one would think twice buying these products. Lets fight the ticking time bomb that is obesity, together! Today I will share with you a recipe I have conjured while experimenting in the kitchen. 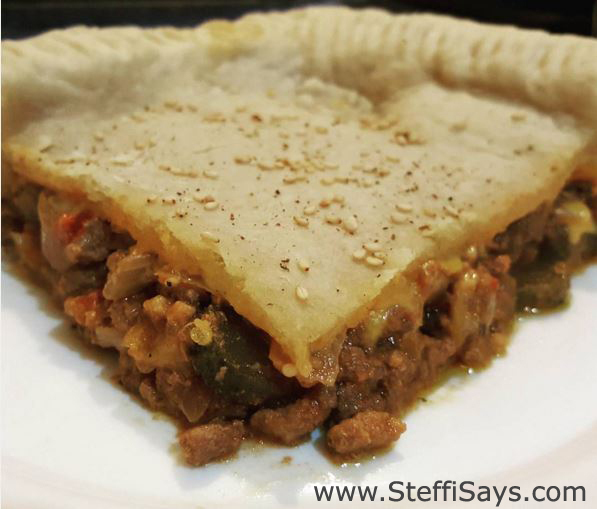 I have been sick the past few days, and I thought I needed an extra boost, so decided to make a meat pie. I also felt like eating something a bit more on the lines of junk food, so I came up with the idea of making a cheese-burger pie. Mix the flour and salt together in a bowl. Cut the butter into rather small pieces and add to the flour mix. Using the ‘rub-in method’, rub in the butter into the flour. Once this is done, start adding the cold water gradually until the mixture can hold together when pressed. Form the dough into a ball and let it chill. Put some butter in the pan, and once it warms up, put in the ground beef. While it is cooking, at some salt and pepper. When it is half way cooked, put in the chopped large onion and add the beef stock. Let this cook until the onion is slightly brown and soft. At this point, I added 3 table spoons of red sauce.Once the mixture is less watery, add the chopped picked gherkins and a few drizzles of mustard. You can add more, depending on how strong you like your mustard. While I left the filling on low temperature, I greased the pie tin with butter, and started to prepare the crust. Once this was done, I spooned the pie tin with the mixture and added 4 slices of cheddar on top and added some more pepper. Finally I kneaded the top part of the crust, and added some sesame seeds for decoration. I cooked the pie in a preheated oven at 180° for about 30 minutes. One of the plans I had for this weekend is to meet up with my good friend Mirka and our Italian friend Paddy for a cook-out. 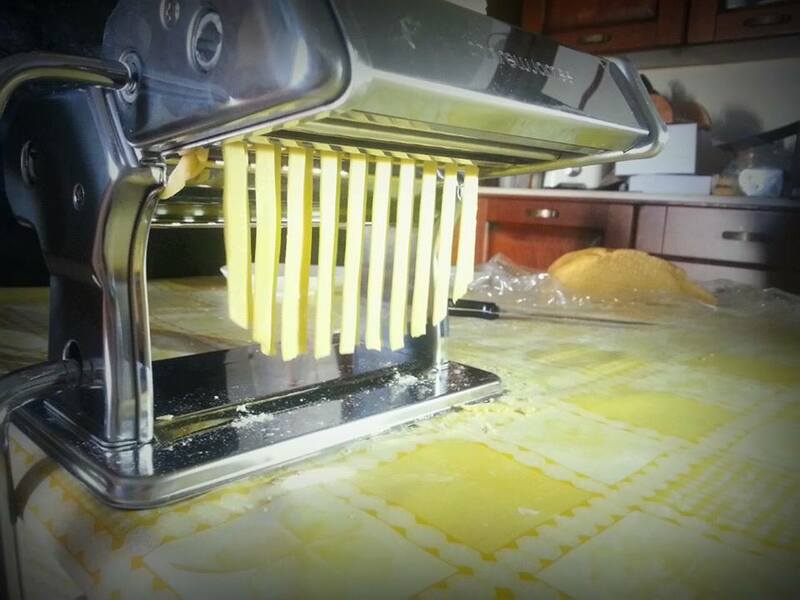 We have been saying that we should attempt making fresh pasta, for weeks; if not months. Finally the day was upon us! 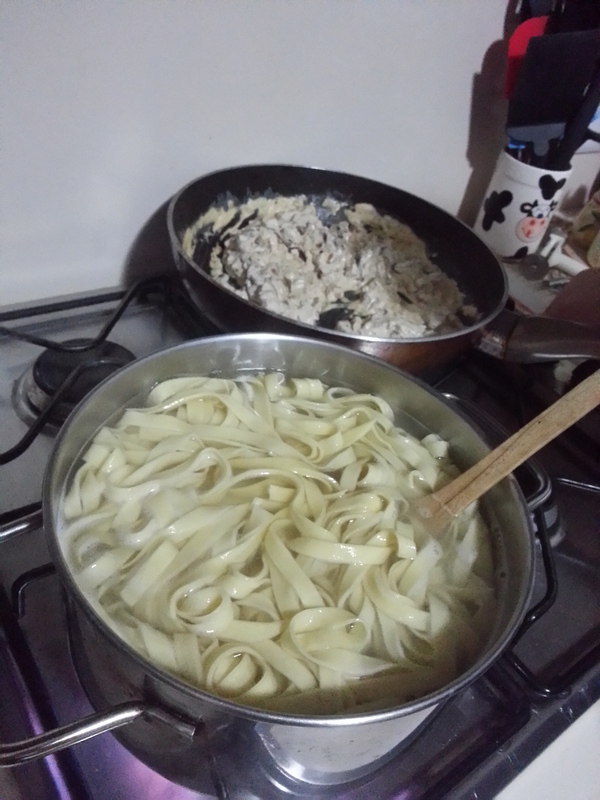 For our first try, we decided on keeping things simple, and make tagliatelle. To make the pasta dough, it turned out to be quite a marathon, or even a workout. We took turns to knead the dough until silky and smooth, and until no flour blobs were visible. Making use of the Andrew James pasta maker was pretty straightforward for us newbies, and we made the most gorgeous pasta. We cooked it in hot boiling water, with some salt and made a mushroom, onion, and bacon white sauce for it. It was great, and I can confirm that the first attempt was a major success!! Most often than not, before making a complaint on Trip Advisor, I try to talk to one of the employees; let them know I am disappointed or that something was not as expected. If they choose to not do anything about it, then it is no longer my problem. I have tried, and I got nothing out of it. And I feel like it is about time to share this with the Trip Advisor society, to warn them on things they can expect. When something goes wrong, I would still when possible mention the good sides of the place I have visited. And just because I see something as wrong, it does not mean that everyone should agree with me. It is only my point of view. So before you complain about a negative rating, learn from it and fix things… Reply with concern to negative rating.. That way a customer feels like his review was read and dealt with.. Especially if the negative comment is ‘voted up’. I will share with you my winner chocolate rock buns recipe. Now, you may think that this recipe is a bit weird, in the sense that it has ground almonds in it, but I thought this adds to both the texture and the taste of the rock buns. When I was young I used to eliminate this and replace it with flour, but boy was I missing out. Before you start making the dough, make sure you start heating up the oven up to 180 degrees celsius. When making sweets, it’s of utmost important that the oven has reached the desired warmth otherwise it won’t cook the cakes properly. Sieve the flour and add the salt, sugar and the ground almonds. Make sure this is mixed thoroughly before you add in the butter or margarine. Stir this first using a wooden spoon and then using the ‘rubbing in’ method. At this moment add the chocolate bits and once this is mixed thoroughly, make a hole and add the beaten eggs. Keep stirring until you get a stiff ‘not so sticky’ mixture. Split the mixture into buns and place them on your baking tray. Make sure the buns look ‘rough’ and you can achieve this by using a fork to rough in it up. Bake for 20 minutes until they are light golden. Cool the rock buns on a wire wrack. You can add more sugar for extra sparkle but I usually skip this. I made 8 buns with these measurements; they were around 10cm each, in diameter.